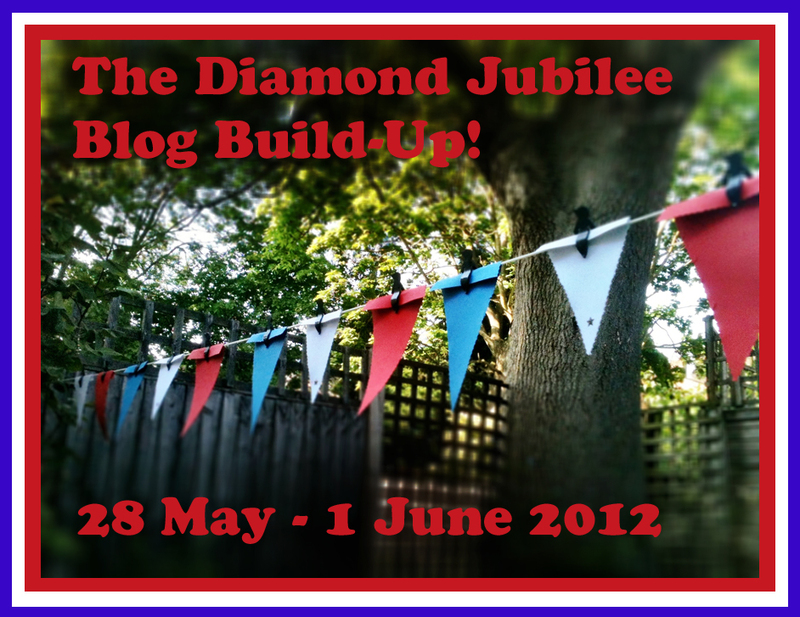 Welcome to Day Four of The Diamond Jubilee Build-Up here on This is Wiss! I hope that you have already been getting some ideas to keep the little people entertained over the coming long bank holiday, but today's post is a beauty. Constructing the bare bones of the boat wasn't too lengthy but I'd suggest if you are making it with a child under 7 then perhaps having the cardboard structure ready the night before might be helpful. It only takes about 10 minutes. I used a fairly thick cardboard left over from the tv box delivered this week. I drew the shape of the bottom of the boat freehand (see wobbly lines) and then made sure there were about 3 inches either side. These will be the sides of the boat so it's really up to you how deep you want it. Score around the boat's base and fold up the sides and the back of the boat. I had to cut at the front so it folded up nicely. This is the bit where the selotape comes into it's own. Cut the shape of the boat in anyway you fancy. 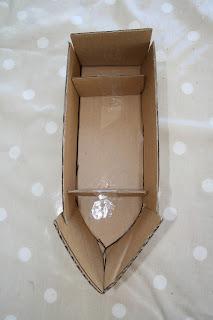 Draw around the base of your boat to make the shape of the deck. Be sure to cut this piece longer than the base and it'll fit really nicely. It doesn't have to be snug, we are going to cover it in wet paper in a minute! Tape it all up again, I cut a hole in the top for money - long enough for a 50p and about 5mm across. The whole idea was so that we could compare what 60 pennies looked against 4 pennies. 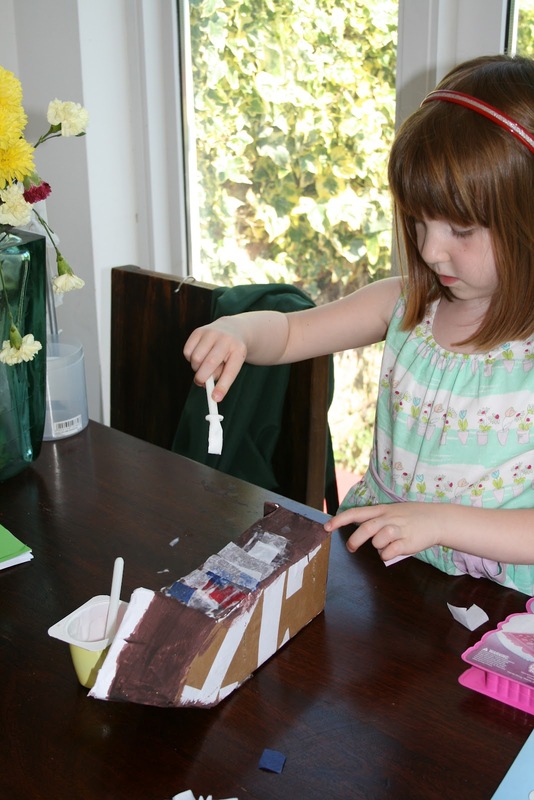 She is 4, the Queen is celebrating 60 years on the throne... do you see what I did there? When I thought about it I realised that the 90 something year old lady next door to me was in her 30's when Elizabeth was crowned. Was she sitting around a kitchen table with her children crafting crowns and decorations? I'll bet she was. It's an amazing amount of time. We did the whole 'who is the lady on the coin?' discussion and then I discovered two things about this genius comparative exercise. 1) Balancing 60 pennies on top of one another is no mean feat. 2) Ruby couldn't have possibly engaged with something less. She's 4, it was hot, something something 4, something something 60, where's the ice-cream? was going through her mind. Thanks to the heat though we got to paint it up after only an hour in the garden. Some poster paint mixed with the glue did the trick and then it was time to decorate. This couldn't go on for too long however as Ruby declared that 'her legs were tired (!)' and she was going to have to pause in the proceedings. Now my idea is that they can use this as a bit of a jubilee piñata. I'm going to encourage (read: force) Ruby to go through my change and put pennies into the money box and once it's full we can bash it up and give the money to charity. I think it's a rather nice idea. That's unless it doesn't go missing again. This morning it was inexplicably gone from the kitchen table and George was playing with it in the lounge. 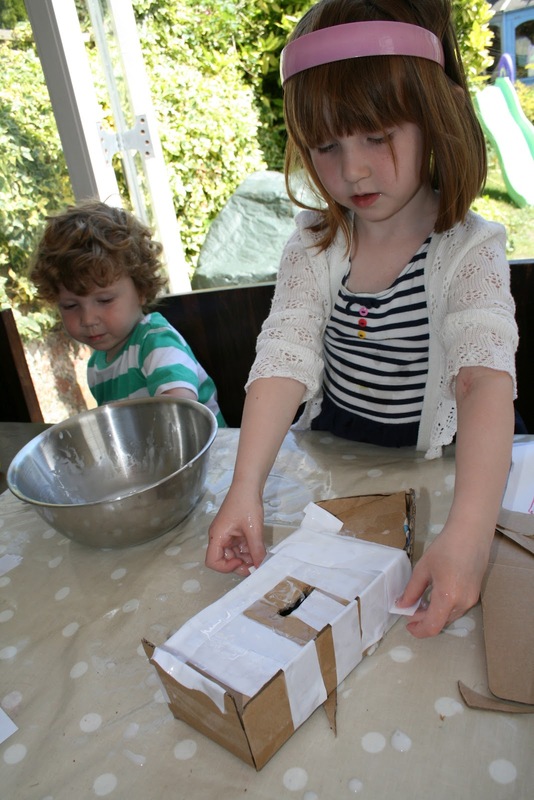 It's remarkably sturdy actually - I'm definitely making papier mache toys again. Cheap and cheerful, they don't have to be perfect and the kids love them. If you don't make one definitely get involved with the papier mache at some point in the future anyway - it is very satisfying! *note: the flag in the top picture is just a skewer and a printed union jack from the net. It's pretty easy to puncture the papier mache if it's not too thick. Good luck!" How cool is that? 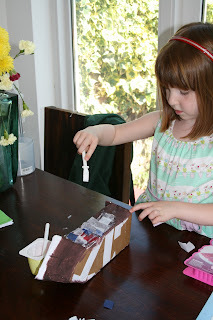 And I love the Playmobil and young Queen Elizabeth finishing touches. Thank you Amy! Don't forget to add No More Disco to your reader list if you'd like to see more of that kind of thing, plus lovely photos of Brighton and fab granny squares! Tomorrow is the last day of my Jubilee event and the fever will be building towards the weekend with some great patriotic recipes! Nom nom nom. See you tomorrow!